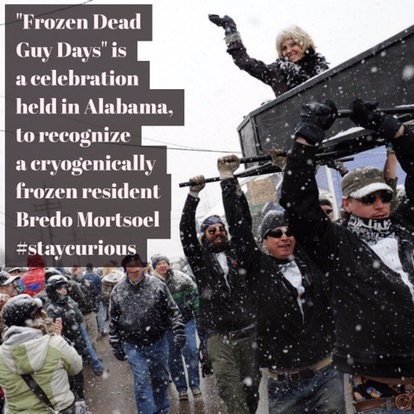 Frozen Dead Guy Days is typically celebrated on the first full weekend of March. Coffin races, a slow-motion parade, and "Frozen Dead Guy" lookalike contests are held. A documentary on "Grandpa Bredo", called Grandpa's in the Tuff Shed, is shown. A newer version of the film, Grandpa's Still in the Tuff Shed, was premiered in Nederland on March 7, 2003.Other events include a tour of the Tuff Shed where Grandpa is still frozen; a "polar plunge" for those brave enough to go swimming in Colorado in early March (which generally requires breaking through the ice); a dance, called "Grandpa's Blue Ball"; pancake breakfasts; a market showcasing local artists; snowshoe races, and snow sculpture contests. Glacier Ice Cream, headquartered in the nearby city of Boulder, makes a flavor specifically for the festival (named, appropriately enough, Frozen Dead Guy), consisting of fruit-flavored blue ice cream mixed with crushed Oreo cookies and sour gummy worms. Tours of the Tuff Shed where Grandpa is still frozen were suspended after 2005, after Grandpa's family "became frustrated with Frozen Dead Guy Days", but they resumed with the 2010 celebration.